I like the glacier green stone on the Seafarers International Union building. 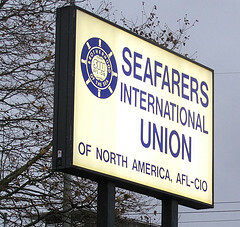 Per the union’s website they represent Atlantic, Gulf, Lakes and Inland Waters District/NMU, AFL-CIO, unlicensed United States merchant mariners sailing aboard U.S.-flag vessels in the deep sea, Great Lakes and inland trades. The union also represents licensed U.S. mariners in the Great Lakes and inland sectors. The building was constructed in 1962 and was originally the National Bank of Washington. This entry was posted in Service Places, Tacoma, WA State - Pierce County and tagged glacier green stone, merchant mariners, National Bank of Washington, Seafarers International Union on December 16, 2010 by admin.